Hello friends, hope everyone had an enjoyable and safe holiday weekend. Here, the weather did not cooperate but it made for a lazy (and much needed) few days off and we were able to salvage Memorial Day and were invited to a beautiful waterfront dinner which was a really nice way to end the long weekend. If you want to see past “club meetings:” then go to top right of my blog where the search bar is and type in “Blue and White Club”, it will take you to all the past posts. I always pick a topic about blue and white to feature and today is part 2 of using blue and white wallpaper in the home. I am a big fan of wallpaper and especially like it in rooms like powder rooms, dining rooms, some bedrooms and certain foyers. I am especially interested in blue and white as not only one but possibly two bathrooms in PB will be done in blue and white. Let’s take a look at blue and white wallpaper in action, then I want to know what you think! Isn’t this fun….Dina Holland took an iconic Schumacher paper and covered the backs of these kitchen cabinets, clever! One lucky winner will win our newest bud vase, perfect for an end table or nightstand. Such an elegant little vase, simply leave a comment on this post and I will select a winner on Friday morning. OK your turn to weigh in, do you like it or love blue and white wallpaper? 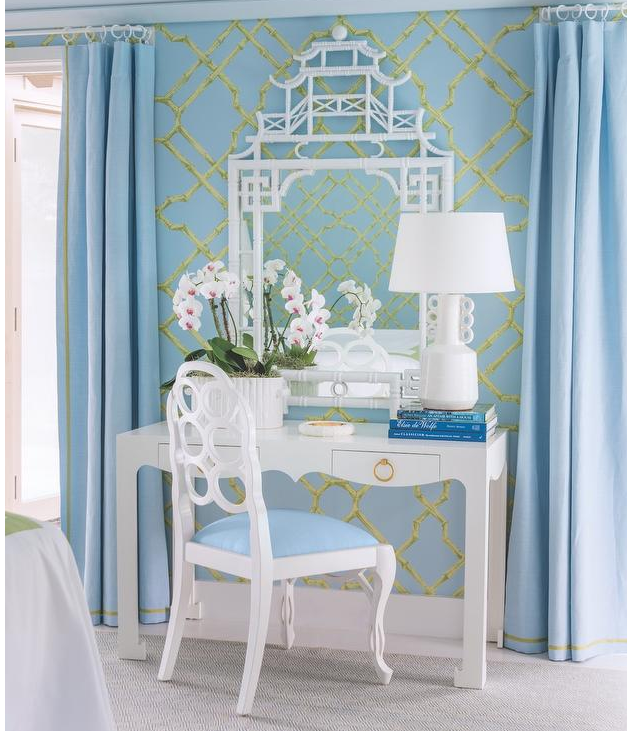 Do you have a favorite room to use wallpaper? Would you ever do an all blue and white room? I would and it’s kind of a shock that I haven’t already:) To me there is never too much! Would love to know your thoughts. Wishing everyone a great day and a wonderful start to this short work week:) Until next time……. 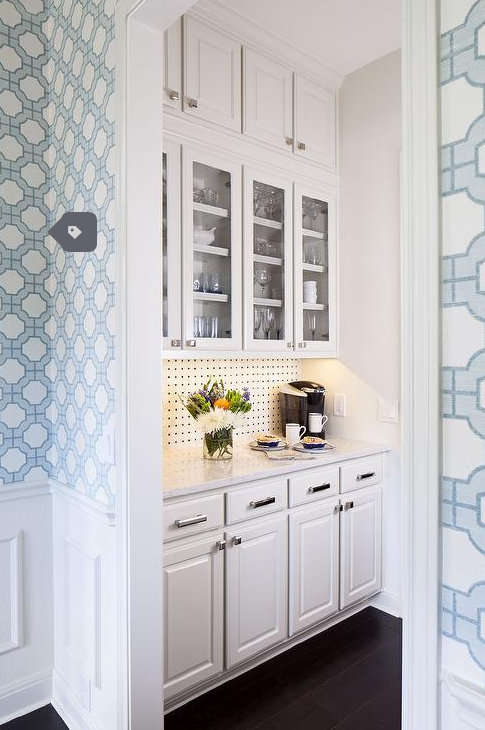 Love the blue and white wallpaper in the cupboards! What a great idea and such a perfect way to use that splash of color for major impact! 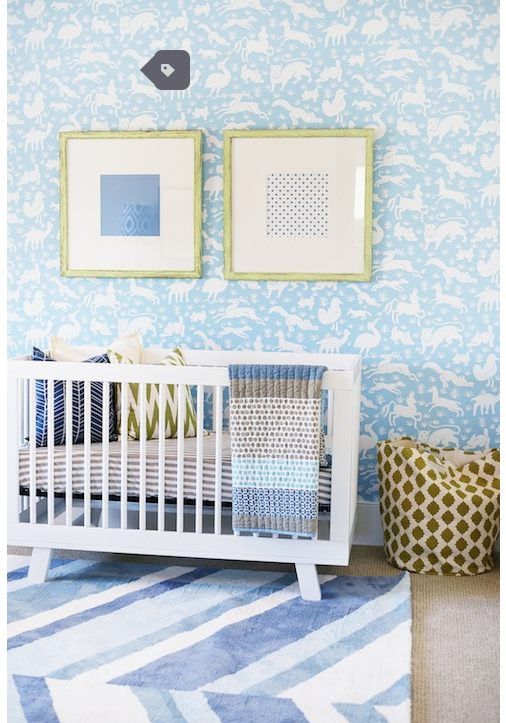 Lovely wallpapers…..one can never go wrong with blue and white! I love wall paper in bathrooms. Makes it so cozy. Blue and white…you can never go wrong. You can’t go wrong with anything blue and white💙💙 in my book. I especially love the paper used in the back of the cabinets. I love all of these wallpapers! So beautiful! Love all of these blue and white rooms. My particular favorites are the wallpapered cabinet back, the mudroom and the bath. A small space but a big impact. I love blue and white. And some of those wallpapers are beautiful. I would consider doing an accent or small powder room. Great ideas. I’m thinking of ways to change my kitchen and I think wallpaper in the can I ets could do it! In blue and white….of course! I am LOVING the blue and white wallpapers! Keeping the furniture minimal and white keeps it classic. So relaxing! I love a wallpapered powder room! It seems extra special in a small space. Wonderful post! Great ideas. I’m thinking of ways to change my kitchen and I think wallpaper in the cabinets could do it! In blue and white….of course! Love the wallpaper in a powder room. The blue paper with marble sink above is exquisite! You have selected some of my favorites! I love the paper in the powder room with the lucite enhanced sink! Love the Blue and White. Can never have enough! Time to glam up the laundry room with blue and white! I love using blue and white wallpaper. I currently have used it in my powder room , master bath a guest bath and the laundry room to make it fun !!! Beautiful blue and white papers. I love the foyer by Sara Bartholomew. Thanks for another great post. I love blue and white wallpaper, and am installing one in my laundry room! Won’t laundry be so much more enjoyable when surrounded by pretty? THANK YOU TINA ! Wallpaper does SO much for any area. So happy it’s back in. Love so many of these pictures. Love wallpaper in a bathroom and foyer! What a timely post. I’m in the throes of redecorating my master bedroom and had blue and white in mind. After looking at your beautiful images I’m definitely going all in on a blue and white retreat. Thank you! Good morning! I love wallpaper in a bathroom. The ones you showed us were just great, weren’t they! Especially the last one you are thinking of using. Go for it. I think you will love it. My favorite is the foyer by Kelly Eagle. Adore the paper. Might change the lamps to blue and white. Blue and white rooms are spectacular. Sooo many options out there. I would love one room dedicated to my obsession. What fun to decorate!! Love all the wallpapers but the powder room done by Amie Corley is stunning. Love would to do blue and white wallpaper room! I’m planning on wallpapering the little alcoves off of our foyer. Thanks for the inspiration! I still love wallpaper and sometimes feel like I’m the only one left. It’s nice to see that I’m not! I’m getting new end tables for my bedroom next week – the bud vase would definitely be perfect! I have been thinking about using a blue and white wallpaper in the guest bathroom. Love how fresh these look. Love the blue and white wallpapers you featured today! Always love blue and white. Great for bedrooms, and I love how it has been used in small areas like laundry room, so unexpected! Love all things blue! Beautiful! 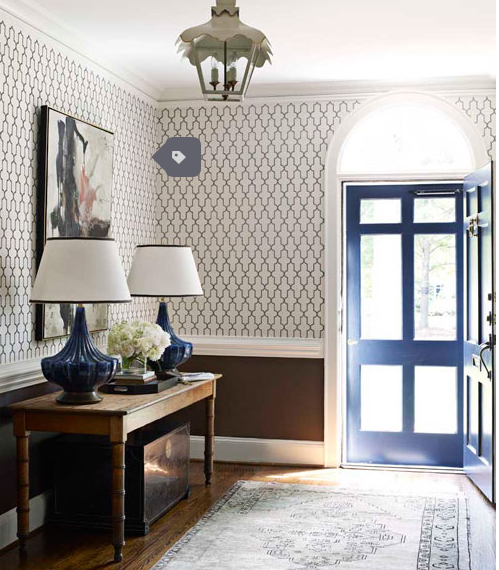 I love the blue and white foyer with the blue front door. My haul of blue and white porcelain pieces from you arrive today! I put wallpaper in 5 out of 6 bathrooms and the laundry room! On the same page! Love the blue and white wallpaper in the kitchen cupboards. I have an old secretary that I’m thinking about adding b&w wallpaper to the backs of the shelves to give it a fresh look. I once had a blue and white buffalo check in my laundry room and loved it! 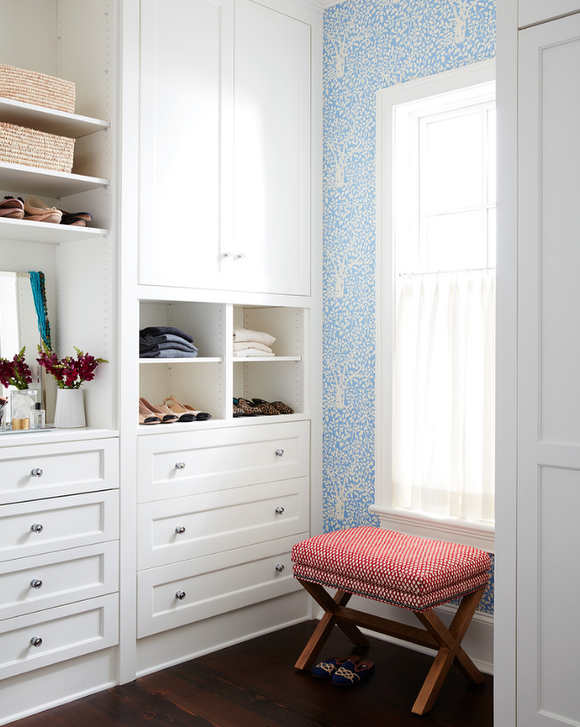 I LOVE blue and white wallpaper and my favorite places to use it are a powder bath and laundry room. These pictures show how elegant blue and white is and the many places that wallpaper can be used, the pictures are fabulous filled with lots of ideas! Don’t mind a rainy weekend occasionally! The cabinet wallpaper is exceptional and very bold. I have always favored wallpaper in a powder room. Now that my heart has stopped pounding–I have to say I love every picture. That’s probably because I’m addicted to blue and white(sometimes with a splash of green or coral thrown in). Enjoyed this blog so very much. Blue and white is fabulous in any place! LOVE blue and white wallpaper! Especially in a bathroom or bedroom, or perhaps a small hallway. I would certainly do a blue and white room- and did in one of my bedrooms. Can’t get enough of this color combination. 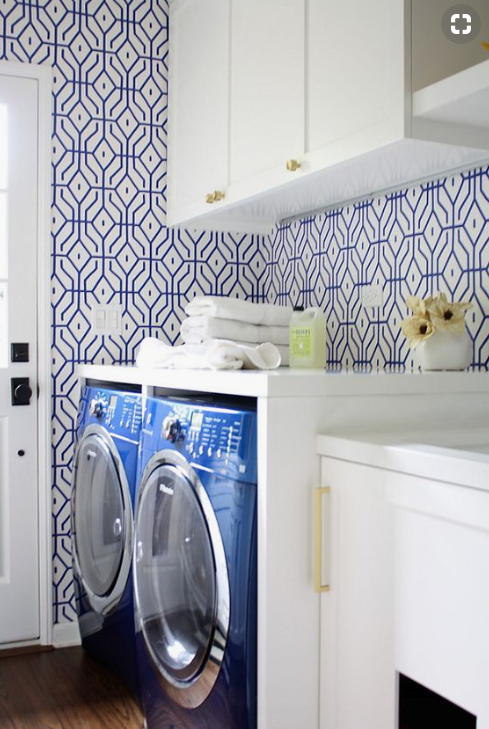 After seeing this post, I want to add blue and white wallpaper to my laundry room! Love the wallpapers! I used them more in other homes I’ve had and had gotten away from it.This post has renewed my interest!! So pretty! Love blue and white wallpaper in a bathroom/powder room. It livens it up and gives just the right amount of punch to the area. 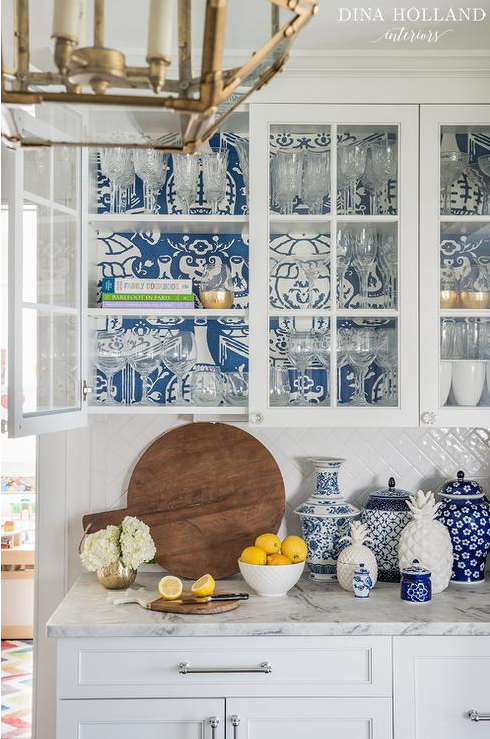 I agree with many of the other posts… love the blue and white paper as a backdrop in cabinets!!! I love wallpaper, especially in bathrooms. Also, the picture of the laundry room caught my eye- how nice to walk in to such a pretty room. Yes I would do a blue/white room especially a powder room! I have a blue ribbon wallpaper on the back of a bookcase in my daughter’s bedroom . It just elevates the bookcase for a custom look. It has lasted 25 years and still looks fresh and clean like it was done yesterday! I love every application you chose to post. My favorite is the wallpaper used to back cabinets!! What a clever idea to use a “pop of paper” in a kitchen or den like an accessory instead of the main event! I don’t use a lot of wallpaper put I love it in bathrooms or as an agent!!! Love all the blue & white wallpapers! Thinking I need to Add some wallpaper in my laundry or master bath! Love all the blue and white photos! Blue and white can work in any room! Love it! I love my Anna French for Thibaut chinoiserie paper in my powder room. Navy and white. I never get tired of looking at rooms with blue and white wallpaper. and there are so many beautiful variations! Thank you for the pictures and comments. I can see a blue and white powder room with a subtile toile wall paper. Love wallpaper in the bathroom. Can never go wrong with blue and white! Lovely examples for using blue and white wallpaper. Your post brightened a rainy morning! Do you have any dining rooms done with blue wallpaper? This old dining room that needs help has exquisite old dark stained cherry wood on the bottom so it desperately needs a beautiful paper on top. Beautiful post!! Blue and white interiors are classic! I have been decorating with blue and white for over 40 years and have never tired of it. My first kitchen wallpaper was blue and white and my vast collection of porcelain ginger jars, lamps and vases just make me smile! Laundry room wallpaper…just the perfect touch in blue & white. Never enough!!! All of it is Just Lovely! Yes! One cannot have enough blue and white in a home! We just renovated our home, taking out walls, gutting the kitchen, new flooring, windows, etc. and of course…wallpaper in the dining room and powder room. The decision process was agonizing, with lots of samples taped to the walls, yet both rooms are now dramatic and subtle as well. It was worth the expense and effort, and brings us joy on a daily basis! You can not have too much blue and white …..indoors or out. LOVE LOVE blue and white everywhere, anywhere! love the idea of placing behind the bookshelves! and the closet idea has my gears turning! Blue and White always brightens my day! Thanks, Tina. I love wallpaper, especially blue and white! I’m renovating our condo and i’ll probably be using the blue and white in one of the bathrooms! I really like it in a powder room which can be dark because of size. I LOVE the idea of a blue and white room, especially a bathroom or hallway. My favorite patterns always tend to be Schumacher and Thibaut. I especially love Schumacher 1889 and Thibaut South Sea in Navy. A navy colored grasscloth is also a great starting point for adding in blue and white accessories and instant texture. I love the blue with the bright green. The vase is lovely! I love blue and white and have wallpapered two bathrooms in my current home with it. I also have a guest room exclusively done in blue and white and love it. My husband also uses that room as an office and he’s very comfortable with it too. So, Tina….I say “go for it” in you PB home. I cannot go wrong!!! I love the wallpapers. I have used wallpaper in kitchen, bedroom and dining rooms. In my current home only in the foyer, but it led to the use of matching deep blue paint in the living room. I love a pure blue and white palette, although I think adding a color gives the room more depth. Ok so now I want to wallpaper my powder room. Especially love the one with the marble sink! I am a fan of using wallpaper in foyers, bathrooms, kitchens, dining rooms. David Hicks The Vase is my favorite wallpaper and I love the use of it in a cabinet behind glass doors, so creative. This post made me smile today, thank you. I’m a new convert to blue and white, but I fell fast and hard! I love the idea of wallpapering the backs of the cupboards! 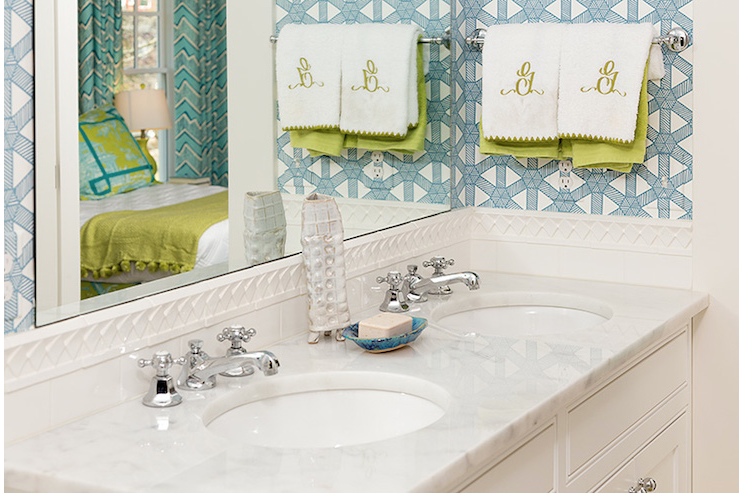 I especially like the bathroom wallpaper with the monogram white and lime green towels. When I was in high school I had a favorite outfit that was blue and lime green, not bright but subtle. I loved wearing that outfit. Everything old is new again, right? Loved these pictures! love it in small rooms or foyers. What a sweet little vase! Always enjoy the blue & white posts. I just couldn’t survive without blue & white! any room but not EVERY room. larger the room the smaller the number of rooms! Imperial Gates is your paper! You featured it twice in two different applications. I also like to repeat the use of wallpaper in different spaces / different colors. Love wallpaper and especially all the blue and white wallpaper! I am trying to pick one for my powder room. I have been collecting and decorating with blue and white china for over 50 years. Needless to say, I hyperventilate when I see your posts. Love all the blue and white paper and thanks for putting it together!! I love, love, love all these wallpapered rooms. I especially appreciate a wall papered entry/foyer, bathroom and a laundry room. It adds so much interest and joy to a room. The touches of wallpaper to the back of cabinets accents the piece of furniture and the items displayed on the shelves. Thanks Tina for sharing these photos. I love this type of post. Have fun picking out wallpaper for PB. LOVE the comeback of wallpaper!!! Beautiful! I have always loved wallpaper in a powder room! Also loved the nursery, so sweet! I love using blue and white in a powder room for a splash of color that provides impact and beauty in a small area. Love the idea of blue and white wallpaper on back of bookshelves! I enjoy your blog. Love the blue and white wherever it is used. What a wonderful way to start a workday, looking at photos of blue and white ! Love blue and white wallpaper, especially in bathrooms and dining rooms! Loved seeing great ideas for blue and white! They are beautiful. I love love the wallpaper!!! I love wallpaper anyway and always will. Sometimes wallpaper is all you need and it can even take the place of artwork. Beautiful examples above. Love the look of the wallpaper in the back of the cabinets and bookshelves. I have always loved wallpaper in powder rooms! I love a blue and white room. I love wallpaper in small baths and bedrooms! I agree with your thoughts about where to best use wallpaper. I’m having loads of it taken down over the next couple weeks so that I can put up more updated papers. Thanks for the inspiration! Love all these wallpapers!! So gorgeous! I agree that wallpaper in a powder room really makes a statement! I believe you would love the last wallpaper in your home in PB. It would be a lovely choice. Thanks for all the great ideas. I LOVE wallpaper in bathrooms. Makes such an impact. Thanks for starting the Blue and White club! Like you, love it in bathrooms and powder rooms. Have also used it in my dressing room/closet. Can’t get enough blue and white. A busy pattern is great, in my opinion, in a powder room or butler’s pantry. But, I don’t like to make a “strong “ commitment in other rooms as I like to change things up periodically. The wallpapers are all gorgeous and especially the bathroom with carrara marble counters. My house is mostly blue and white with some gray and dark red. The beautiful vase would fit right in! Love bud vases and this one would be a pretty addition to my blue and white master bedroom! Thanks for brightening up a dreary after holiday Tuesday. It warms my heart to see blue…. Always the powder room gets wallpaper ! I really like the subtle papers for foyers as well. My living room is an all blue and white room. It’s beautiful ….if I say so myself. ☺️ The textures and other elements make it seem to not be just B&W. I love wallpaper in a 1/2 bath. One of my favorite rooms in my own house. Dina Holland Interiors is my favorite! Love blue and white, and every single room you shared! Love the ideas for the bathroom and the cabinets . I just started my blue and white collection purchased my first piece from you . My favorites are the blue and white bathrooms! Lovely. Bleu has been my favorite color for all of my life. Thanks for sharing all of the lovely pictures. Love blue and white anything! Would do it in every room. Each room is so unique. I am drawn to the powder room by Amie Corley and the small repeat pattern in the bedroom by Tiffany Ritchie and Chrissy Shields. I also like the laundry room with the trellis wallpaper. Thank you for the great ideas. So many amazing papers. I absolutely love them all! 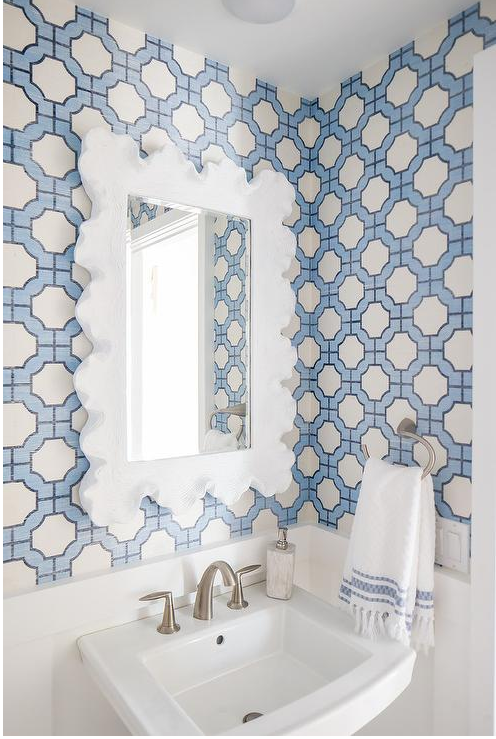 I have blue and white wallpaper in my master bath and still love it! The vase will be perfect with gardenias on my silver vanity tray which has blue and white happiness jar with other pretties. I really like the idea of using a dramatic wallpaper in a half bath!! And, of course, in blue and white! Love all of the bathroom/powder room wallpapers. Go bold! LIKE B&W WALLPAPER ON ENCLOSED (GLASS/SCREEN) PORCH, PERHAPS ONE/TWO WALLS,OR POOL CABANA (HAMPTONS) WHITE WICKER , NAVY /WHITE STRIPE CUSHIONS B&W GARDEN SEATS(LOTS OF THEM) GLASS TOP TABLES, B&W RUG. OF COURSE THAT BEAUTIFUL B&W VASE YOUR GIVING AWAY SETS IT ALL OFF!! ADD IN B &W GINGER JARS. ELEGANT/CLASSY INDEED!! I love blue and white wallpaper! Especially in a guest bedroom. Beautiful, timeless and refreshing are words that come to mind. I would love to wall paper my laundry room blue and white. It is the first room you see when u walk into my home. Blue and white are very soothing colors. Glad wall paper is back in style. Great ideas! Would love to put blue and white wallpaper in our powder room! Such beautiful wall paper. It’s has me rethinking! ❤️ Every picture you posted is beautiful! Yummy! Thank you for sharing all the beautiful rooms with wallpaper! I LOVE wallpaper too, so loved looking at all the possibilities! I have loved blue and white forever and would use it in a foyer, a powder room, a hallway, an accent wall, a dining room, or a guest room! You have shown some great examples – too many to choose a favorite! I particularly like the powder room toile and the console table area flanked by side chairs. Wall paper has a certain elegance. And with blue and white, as we all know, you can never go wrong. I’d love to use blue and white wallpaper when we redo our laundry room! I think I’ll even want to do laundry more often in a pretty space. I am so grateful to you for still loving tradional design. I read once “trendy is the last step before tacky” and I have to agree. Yes, like it. My mom would do a whole room blue and white. I would not, love color too much. I have wallpaper in my dining room, master bath and guest bath now. Hi Tina, Thanks for all these great photos, love them all! Just love the wallpaper in the powder rooms but the bedrooms as well! I love all the blue but what is so great is it doesn’t feel overwhelming when you have such great contrasting colors as accents – it just settles in as a calming lovely backdrop! Thanks for always providing such a fun distraction during such busy work days! I did wall paper in the past and would consider doing some in a laundry as shown. I think it is refreshing! Especially love the blue and white when mixed with a little green! I love, love, love blue and white and most of my house has blue and white decor. I always use wallpaper in powder rooms/bathrooms. I love the bold blue and white paper pictured in the cabinets with the crystal in front. What a statement! The dining room is my favorite space to use wallpaper. To me it adds elegance, depth and warmth. Love using bold wallpaper in the bath, especially; a small half bath. Also loving the look of the wallpaper on the back of bookshelves. Adds a lot interest for little money! Love love love the Meg Braff design in the first photo! I was thinking of wallpapering my guest bath, and now after seeing these beautiful rooms I am off to hunt me some blue and white paper. Be beautiful with my guest bedroom, also in blue and white. 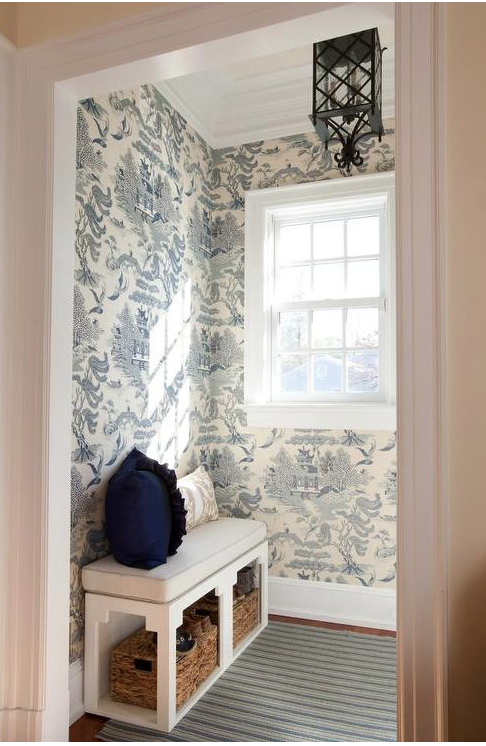 Loved the paper in the mudroom and the chinoiserie paper in the powder room!! Oh my goodness, beautiful blue and white ideas make me want to redecorate my house. Your posts are so inspiring especially the furniture, floor and wall coverings, and accessories with pops of color- LUV!! I didn’t see a single picture I didn’t love! So many great ideas. I would love to do a blue and white guest room someday. There is never too much blue and white in the world —always fresh and friendly in a palette but also elegant and timeless. A lot or a little “blue and white” goes a long way ….every day! I adore Blue and White wallpaper. I am currently looking for an easy peel and stick wallpaper for a single wall in the guest bathroom. I have a blue and white living room. I love the blue and white wallpaper but have not used it as yet, although I have been thinking about it! You can never have too much when it comes to blue and white. Blue is my happy color! 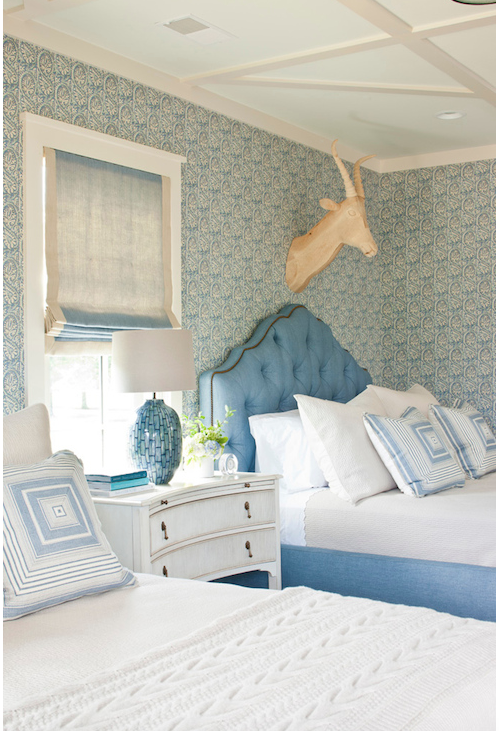 Love when an entire bedroom is papered in blue and white. I did one in in old house with many different angles and it was beautiful. Your eye didn’t see all the mistakes and angles. I loved waking up on a sunny morning in that room and would just lay there and take it in. The picture I loved most was the closet done in blue and white. My next home I’ll definitely have wallpaper in my closet. Glad to see wallpaper is coming back. Thanks for showing the many papers and ways to use them. So pretty. Would use it by my kitchen sink, with flowers to accent the seasons. Love wallpaper, especially in a powder room and the back of shelves. These blue and white patterns are gorgeous and have given me some exciting new ideas! I was never a huge blue and white fan till I came across you and your gorgeous taste. Now, I can’t get enough. “Blue Willow” wallpaper for the bath in my new apartment would be perfect, just right for me. Thank you for suggesting it. I love it all. Would love to know the source for the pattern shown on the first page. Bathrooms, by far, are my favorite place for wallpaper. An accent wall is great, as well. Then adding the blue and white porcelains in as many patterns as I can fit in the space. Love the blue and white paper for my powder room! I’m a member of the blue and white club too! 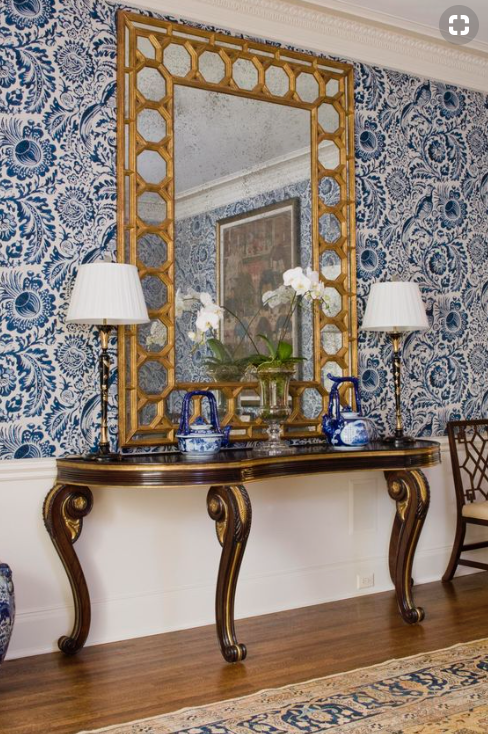 I love wallpaper in a powder bath or dining room, especially a Gracie chinoiserie paper! 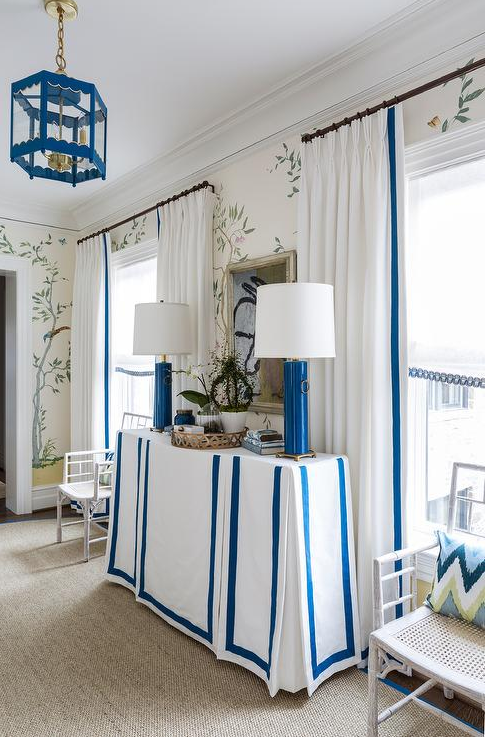 Years ago, my love of blue and white toile was “born’ when I saw it in a show home bedroom — absolutely everywhere — ceiling, windows, walls, linens…over the top fabulous. So happy to see wallpaper coming back! These are especially beautiful. I have several blue and white rooms which look crisp, and fresh yet can be very soothing spaces. Love it in a bedroom with white linens and blue and white shams and adjoining bath yet my living room is full of blue and white porcelain accents that make everything pop! I really like the idea of using blue and white wallpaper in the laundry room. That Blue Willow wallpaper is gorgeous! I am getting ready to transition my living room to blue and white and bought drapes late last year…but now cannot find where I stored them! Ugh. Thanks for these great pictures, they are such cool inspiration. Love the blue and green in the first picture – so soothing! So many lovely wallpapers and fresh ideas for them. I love antique CANTON BLUE and WHITE Chinese porcelain. I mix my antique CANTON with ENCHANTED HOME porcelain pieces and illuminated BLUE and WHITE pieces from QVC. Yes, QVC. I’m in the beginning stages of remodeling one of my bathrooms with SHUMACHER CHIANG MAI blue wallpaper. For the past two years, I’ve been purchasing accessories for this bathroom. Two of the accessories will be a pair of ENCHANTED HOME mid-sized BLUE and WHITE pagodas that I’ll place on either side of the bathroom’s vanity/sink mirror. It’s a work in process……can’t wait to get started. I am so excited. And yes, I love BLUE and WHITE. I have at least one BLUE and WHITE porcelain item in every room of our home. BLUE and WHITE porcelain items can be found placed on my floors, on an étagère, a CANTON plate placed on a wall or a BLUE and WHITE vase placed on a dresser. There are so many opportunities to display BLUE and WHITE porcelain. I love BLUE and WHITE porcelain whether it’s antique or not. BLUE and WHITE porcelain completes a room. These wallpaper applications are wonderful! So much to think about! Thanks for hosting this sweet giveaway, Tina! What a beautiful post! The wallpapers infuse the rooms with personality. Absolutely love the blue and white toile paper used by Inhabit Interiors. I once used a blue and white toile in a two story foyer. It was stunning, and when it came time to move again our house sold immediately without even going on the market! They loved the foyer!💙 I will be doing a wallpaper in our powder room soon, great options shown here! Thank you! I must have that Wallpaper in the first picture! On a quest to find it. Thinking of trying the wallpaper in my kitchen cabinets! With everything blue, white and simple-life just seems easier- especially the bedroom designed by Tiffany and Chrissy with the blue and white wallpaper and the white linens on the bed. It’s all about the details! Thanks . Love wallpaper in a powder room and on the interiors of bookshelves. It adds interest without being overpowering. I have been furnishing my homes with b/w as the primary color range for the past 30 years. Depending on the home location and house style the third color would be in the camel/brown/gold range or pink/green range. Yes, I like b/w wallpaper and have used it in dining rooms, laundry rooms and entry rooms in past homes. My current home doesn’t have any wallpaper yet, looking very seriosly at Thlbaut’s gorgeous powder blue trellis (with subtle medium blue and beige outlining the trellis pattern-so pretty!) for dining room. I’m toying with the idea of hallway wallpaper as well but am leaning toward a custom hand painted Gracie style scene which would use multiple colors but heavy on b/w. We now live on the SW coast in Florida and our family room is all b/w grounded with natural pecan wood flooring and a few brown wood upholstered (b/w fabric of course) pieces of furniture to balance all the b/w. It’s soothing and crisp and so pretty without being overly feminine. Oddly, I‘ve never done a b/w bedroom either although the rooms alway included blue in the color scheme. I was lucky enough to see Mark D. Sikes gorgeous Blue/white bedroom at the Kips Bay show house this year and I love how he used a green Gracie paper (with blue accents!) to create a lovely cozy, balanced feel. I was so inspired I’m thinking along those lines for our Master bed room now. Blue willow wallpaper is such a classic. 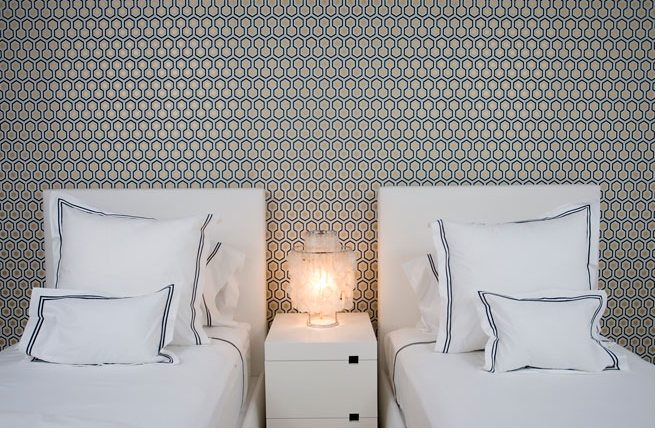 Wallpaper elevates any room and adds such interest. Go for it and I bet you will love it!! 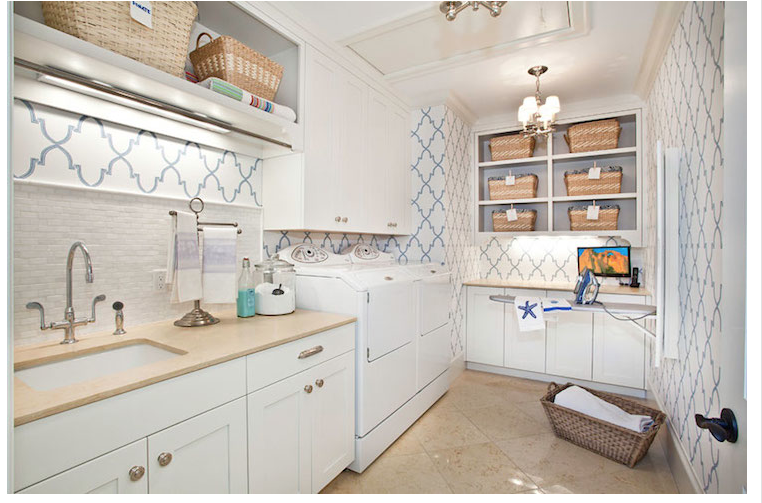 Love the blue and white in the laundry rooms and the powder rooms seem so fresh and inviting. Thanks for sharing once again. I love blue and white in ANY room! This is a fabulous post! 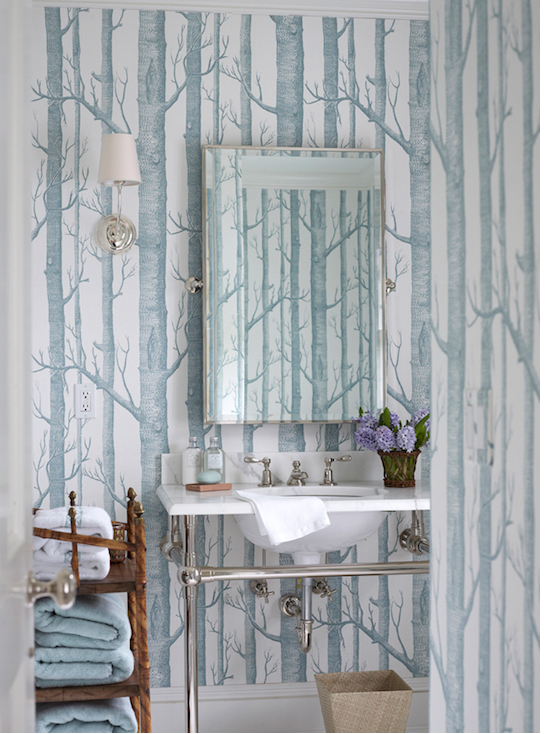 I’ve been playing with the idea of blue willow wallpaper in my powder room. Now, I’m convinced I will love it! I’m thinking of doing some blue & white wallpaper on the back of my built-in’s. This gives me so many ideas! Just did my powder room in thibaut, blue and white country french wallpaper. Love it! I grew up in an old home with plastered walls which could not be painted and therefore, every single room was wallpapered!!! I vowed to never have wallpaper in my home again. I must admit these pictures have me rethinking my “no wallpaper” policy. They are just beautiful! I really love the Colordrunk Design bathroom! But have to say I loved all of them…anything Blue and White will turn my head! I am a blue and white addict. Thanks for the fabulous pictures! Love blue and white wallpaper in smaller areas like bathrooms. However, in areas like living rooms and bedrooms it doesn’t work for me because it competes with wall art. What a great collection of blue and white wallpaper used in every good way in every space imaginable! I think this post is a file in my computer now! So many beautiful choices! Blue and white feels calm and serene to me. 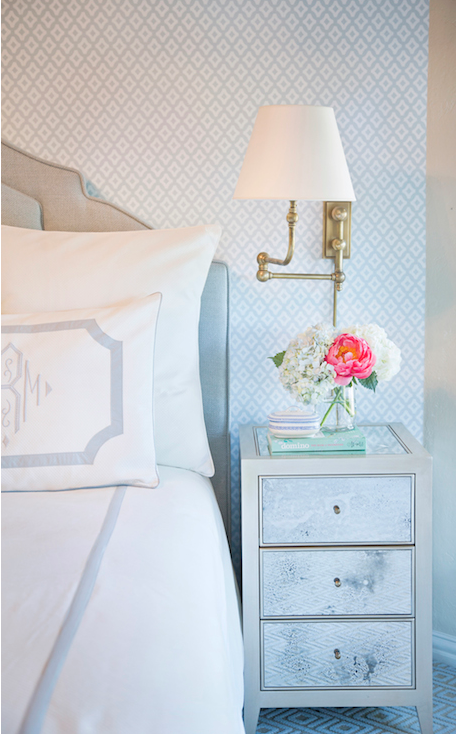 One of my guest bedrooms is blue and white.. . You can’t go wrong with that combination. And it works with so many other colors so you can put in a splash of something else.. I love the large pattern blue and white wallpaper in a powder room… It looks so elegant. I LOVE blue and white wallpaper. I haven’t done any wallpaper yet in our new home. I think our last home burned us out. Our last home, 100 years old, had wallpaper in every room and two layers of white wallpaper on the ceilings. We took it all down and exposed the beautiful plaster underneath. I may have to rethink for our new home! These wallpapers are truly inspirational, lots of beautiful ideas. Have been wanting to wallpaper a bath, this may just jumpstart me. Blue and white is always so fresh looking…especially welcom in spring and summer! Blue and white is so fresh looking…especially welcome in spring and summer! I love an all blue and white room, can’t have too much! Thanks for helping us see options! Thank you for the opportunity to win this gorgeous vase. This vase is lovely. I love the blue and white combination. I love the last pic also. Definitely grabs your attention in a beautiful way. I want to do the back of a glass front cabinet. I like it but would do it in smaller rooms or in subtle patterns so my blue and white ceramic/porcelain pieces don’t fight with the walls. I actually did like that entryway bit the picture only shows a portion of the area, I think, and more might be too mich.
My favorite has to be the happy bedroom by Ana Cordeiro. 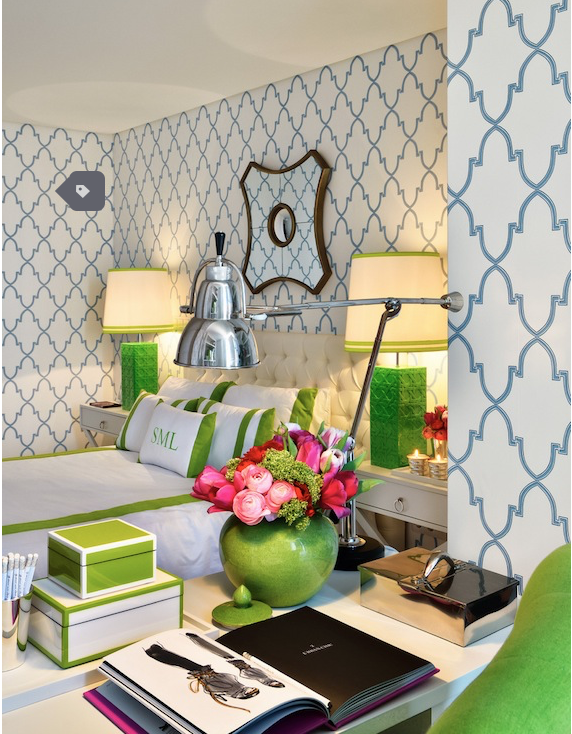 Love the green accents in this preppy room. I love wallpaper, and would adore it in just about any room. You have charmed me into doing blue and white all over my house! I am a serious blue and white club member! Would dearly love the little bud vase—it would be a perfect complement to my blue and white passionate decor! I’m obsessed with blue and white, mostly chinoiserie & other pottery& ceramics from around the world. Our bedroom color scheme is blue and white, though I’ve never used wallpaper in the bedroom before! I love the print on the walls on Amie Corley’s powder room – it matches my curtains, bedcover & pillows! 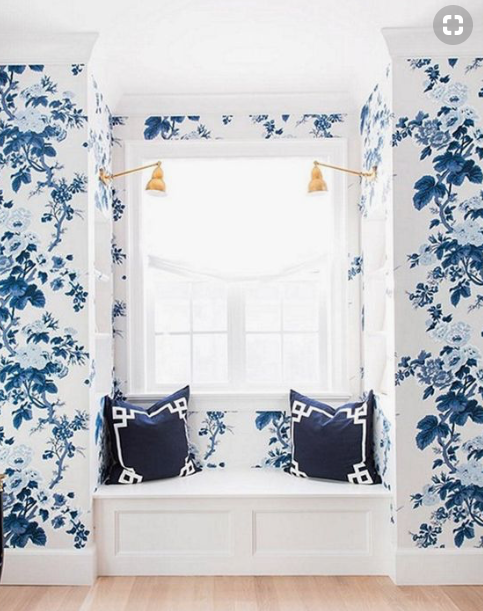 A small powder room is the perfect place for a bold blue and white paper. Also always love a chinoiserie anywhere! I love blue and white wallpaper in the powder room! I love the powder rooms and am working to convince the hubs to paper ours in blue and white! 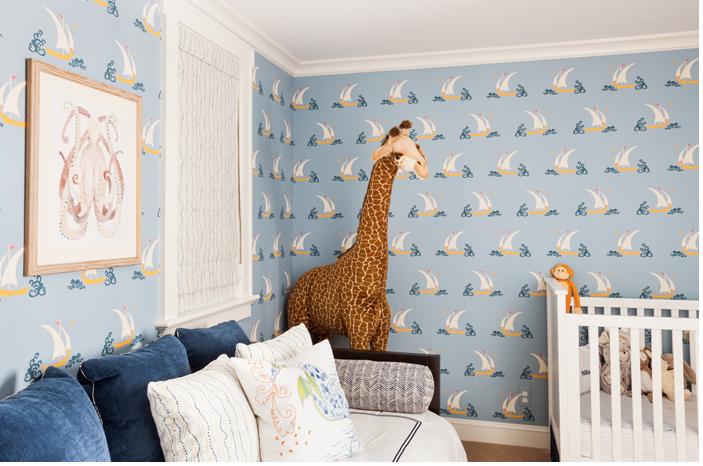 Thanks for sharing the wallpaper rooms…beautiful and imaginative. I love blue and white, always a classic. Never goes out of style. I have been considering wall paper in my cupboard – white dishes, pretty! Blue and white club rocks!! 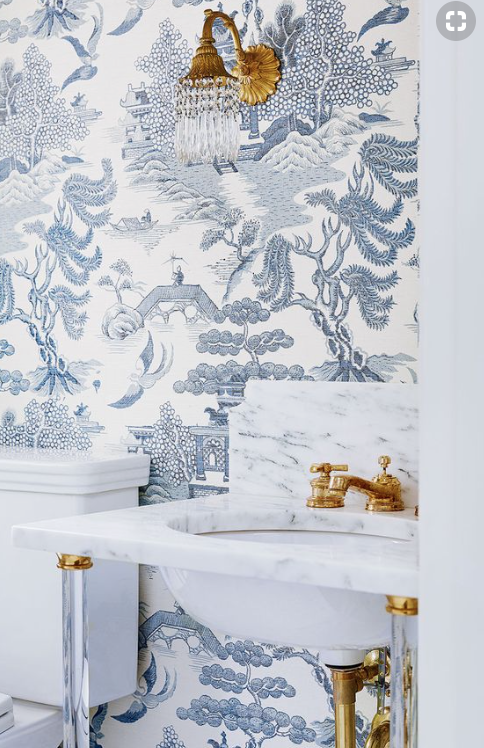 I adore the oriental wallpaper in the beautiful powder room by Amie Corley. Also, love the wallpaper on the back of the bookcases! What a great way to add interest to the background of the bookcases! Beautiful papers and great ideas ! Blue and white always offers so many options. I have blue and white toile wallpaper in a bathroom with matching fabric for the shower curtain and valance. Have it now for over 20 years and still love it. I do love wallpaper. Only one place in my house right now, and that’s the dining room lower half, below the chair rail. Decorators Best has a good selection with affordable prices. Thanks for rewarding your faithful readers. They were all so lovely. I especially loved the bedroom with the small repeat. Bedding is so elegant and classy. I think an all blue and white guest room would be phenomenal! Love the wallpaper in the kitchen cabinets. What a way to update older cabinets ! Love a lot of these papers, new food for thought! I always enjoy seeing Teddy at the end. 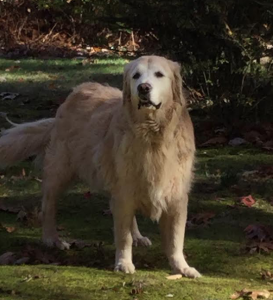 Our girl just turned 14. I am nervous about wallpaper but your pics looks so good. Maybe I’m missing out. And yes, a blue and white room or rooms would look so lovely. Crisp and clean, or soft a dreamy. So many goodies for Pinterest! Thanks for the blue and white inspiration, Tina! Beautiful wallpaper! Great way to start your morning-looking at the beautiful things. I will have to readjust to wall paper again…..however, if I was to do it, it would be a powder room & yes definitely blue and white! Inspired once again!! Love wallpaper in small areas especially! This is a beautiful post. I have always loved wallpaper, just not in every room! I think that wallpaper is an important part of an interesting flow in a home. Just started a “blue room” thanks for the fabulous ideas for wallpaper!! Some of these papers would make a lovely accent wall for those afraid of committment! Love the wallpaper in the utility room. it anywhere especially in the bathroom. I am slowly getting obsessed with wallpaper – had both of my powder rooms done – and love your idea of papering a pantry! I’ll head there next before doing a bedroom – I love it! The Meg Bragg and the Chrissy Shields are my two faves… also definitely looking at wallpaper in cabinets now!!! I love the wallpaper, and would love to do it in a powder room. Such beautiful wall paper. Thank you for lots of good ideas. Please keep posting pics of Teddy. I look forward to seeing them. Love these wallpaper selections(especially the Blue Willow💙)! I love all the beautiful blue and white room ideas. Looks so elegant and classic. I’ve always loved wallpaper. The last paper shown will look fabulous in your bathroom. Love all your blue and white wallpaper pictures. Yes, I have a blue and white guest bath with wallpaper I found about 9 years ago. 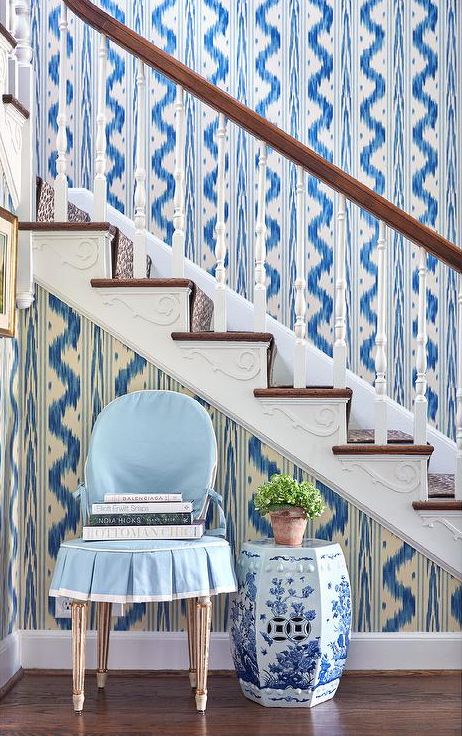 It is a fabulous blue and white toile called “Barnegat Light” made by Thibaut. Since I live at the Jersey Shore, very close to the real Barnegat Lighthouse on Long Beach Island, this paper was perfect. I could not resist when I saw it in a decorating magazine. Not sure if it is still available but everyone loves it. I will try to send a picture. All great looking rooms. I especially love wallpaper in nurseries and powder rooms. Love blue and white anywhere but wallpaper takes it to an even more wonderful level Have always loved wallpaper when used with a bit of restraint. So many great ideas in the world we love of blue and white!! Blue and white wallpaper is wonderful. Thinking about lining a china cabinet in it. Love, love, LOVE these wallpapers! I’m searching for a paper for my powder room and loving all these ideas!! My home is absolutely filled with blue & white!!! And has been for over 35 yrs. B &W wallpaper has been in my foyer for almost as long. I will never tire of this combo or seeing what others are doing. Love your website! Love them all – so hard to pick a favorite! You can never go wrong with blue and white.